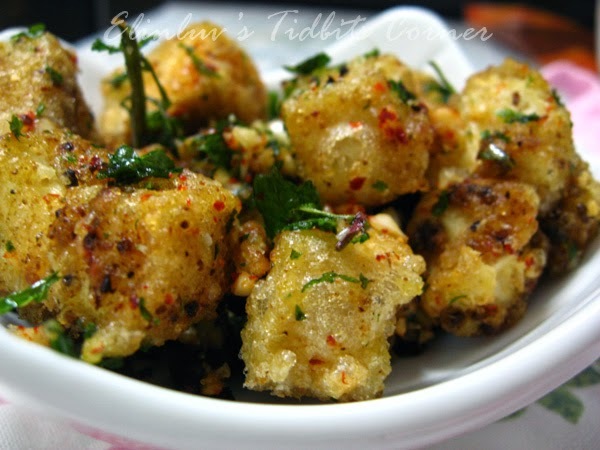 with the deep fried tofu.....simply delicious !!!!! 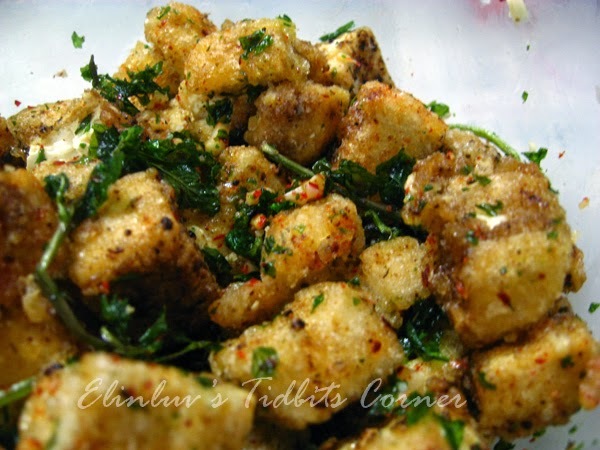 Cut the brown tofu into cubes and coat the tofu with the seasoned flour ( make sure every corner is covered with the flour. Heat up vegetable oil in a wok until you see bubbles at the end of the chopstick when you place the end of chopstick into the oil. Slowly put in the tofu and deep fried till crispy and golden brown. 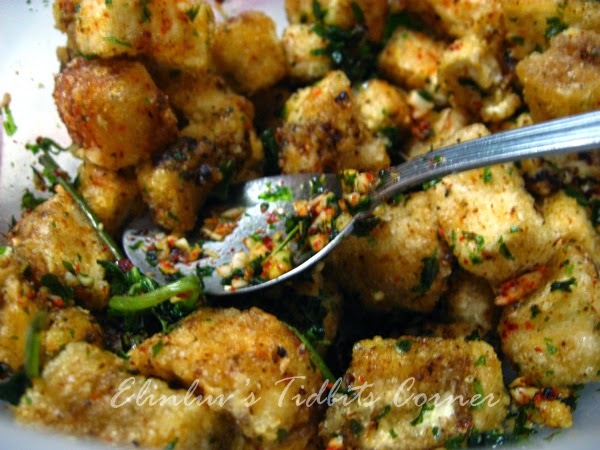 Take out and placed the fried tofu on a kitchen paper towel to absorb the excess oil. Put in the dry mint leaves into the hot oil and give it a stir until you see the mint leaves are crispy. 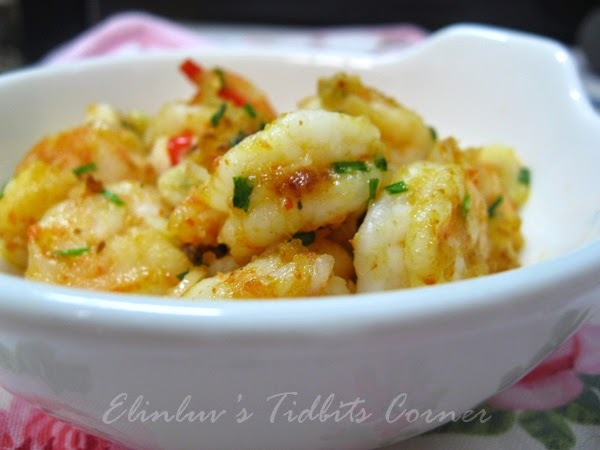 Dish up and place them in kitchen towel to absorb the excess oil. In a small mixing bowl, add in the raw garlic, fried mint leaves ( crushed it ) chilli flakes and sea salt to taste. Add in all the tofu and stir mix till the deep fried tofu are well coated with the seasoning. Serve it while still warm. 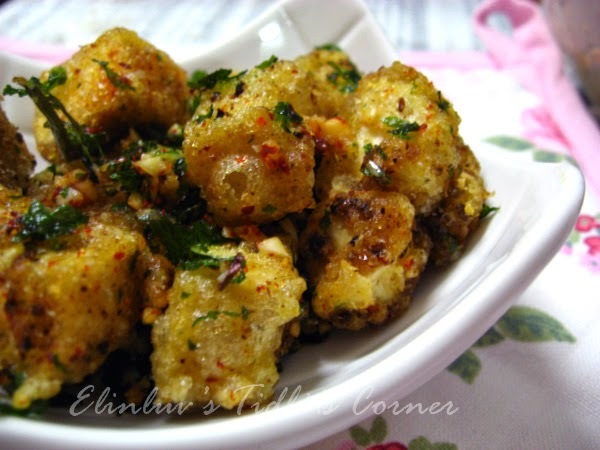 * This street food tofu can be served as snacks or as a dish stand alone. 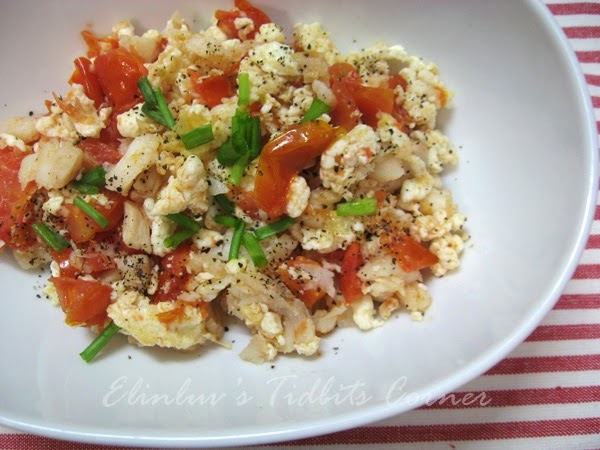 This is the most interesting dish I have ever prepared and guess what? 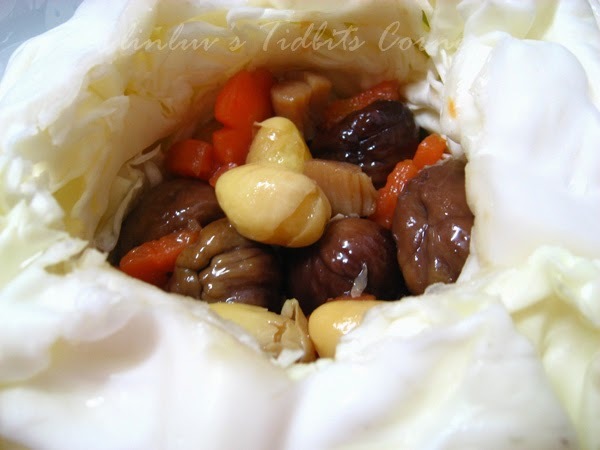 I have to core out the centre stump of the cabbage and fill up the cabbage with delicious fillings. 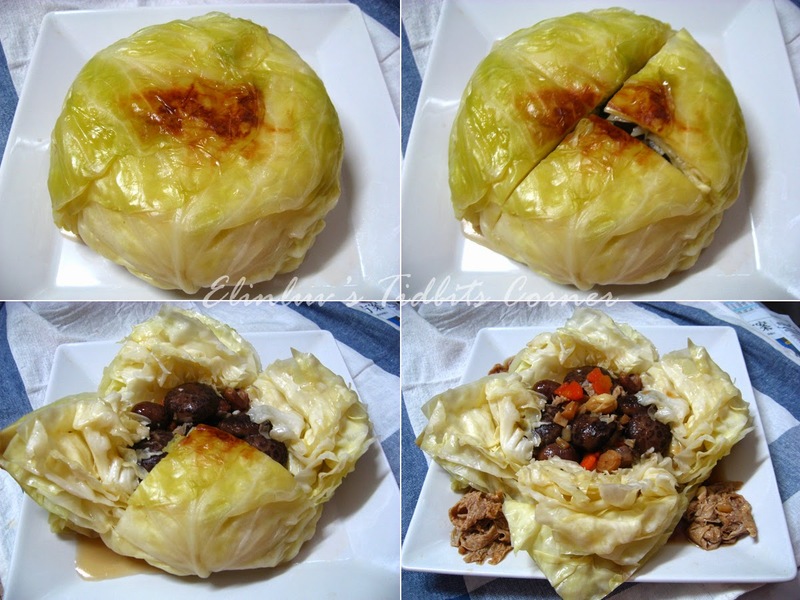 I saw this in one chinese magazine ( can't recalled) and I was inspired to try it out and here I present to you the special steamed stuffed cabbage :) I should have steamed it a bit longer as the cabbage was still crunchy...cooked but crunchy. I would have preferred it to be a bit more softer so that it can absorb in more of the gravy. Anyway, this is a good try and I love the fillings...so tasty and you can dip the cabbage onto the gravy and mmmmm so yummy good ! 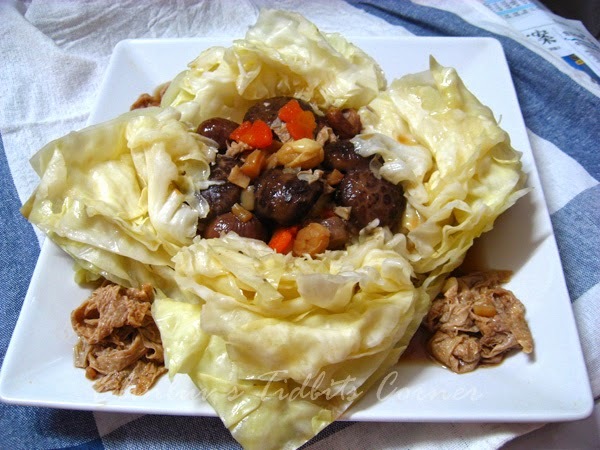 I chose a small round cabbage for this steamed sutffed cabbage coz this dish is only for two person. Soak and clean cabbage. Core out the center of the cabbage from the base...just enough space for the fillings to go in. Drain off excess water and keep aside while you prepare the fillings. Braise all the fillings ingredients together with the seasoning and stock till the ingredients are cooked and soften and the stock liquid has reduced and thicken. 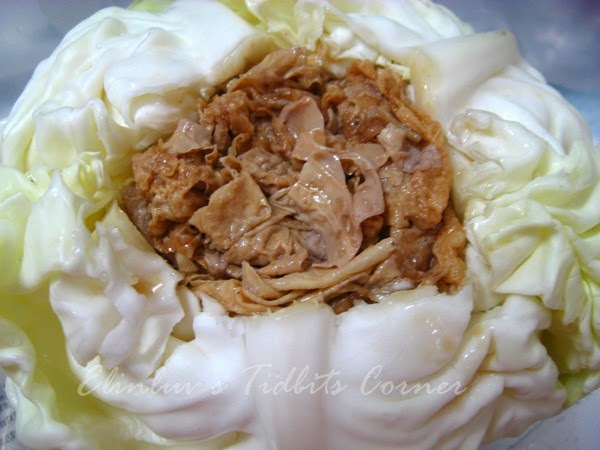 Stuffed the cabbage with the braised fillings with the beancurd on top...the beancurd will act as a stopper. Gently placed the stuffed cabbage that the base is facing top and sits on a 4" deep non stick pan. Add hot water to the pan and make sure the water height covers at least 2.5 inches of the cabbage. Cover pan with lid and steamed for at least 30-35 mins over medium low heat or until the water has evaporated and the cabbage has soften. Off heat, and gently overturn the cabbage with the opening facing bottom onto your serving plate . 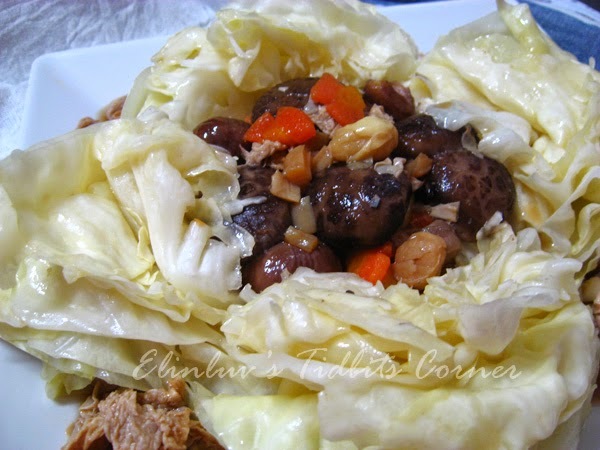 Cut slits across the cabbage and open the slits to expose the stuffings. I asked him what is the course about and how is he taking it, he replied that the topic thus far is what is marriage about and financial management as a married couple. Before he got engaged with Elaine a year ago, he was frantically searching for couples rings and now he is just as frantic looking for couple wedding bands for his forthcoming wedding. I pray that he finds one that is to his taste mmmm Elaine his wife to be must be delighted with it too. I pray too that the wedding plans goes smoothly for him too. I still can't believe my baby is all grown up and getting married soon too ! 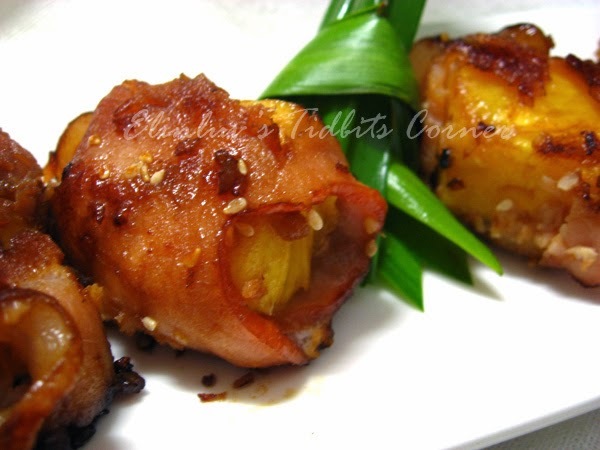 These bacon wrapped pineapple bites were so good that I will be making these again for the coming Christmas dinner as appetizer :) I used smoked back bacon ( more lean ) It turned out crispy at the edges and juicy as you bite into the pineapple chunk that is wrapped by the bacon...mmmm so yummy delicious. 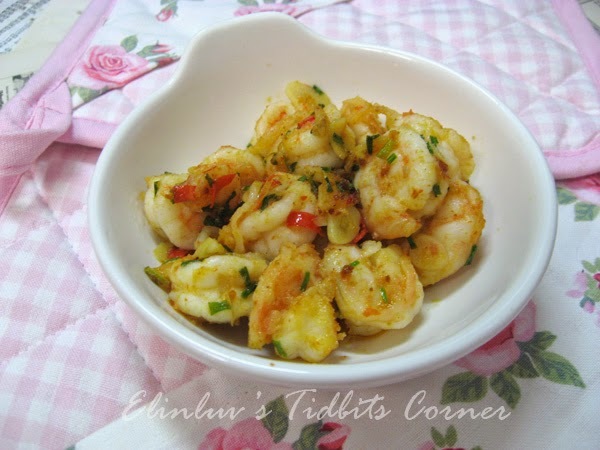 You can serve these as finger food or appetizer. Every bite is addictive. 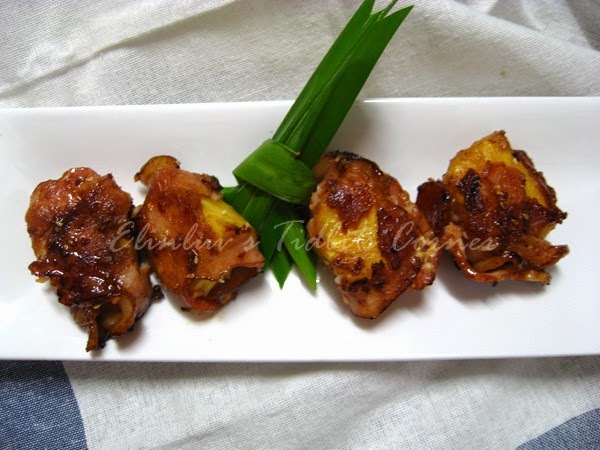 I concoct my own sauce for glazing and WB was giving me the thumbs up as he was tucking in the bacon wrapped pineapple bites...as the saying goes ...' finger licking good ' :p You can either bake it or pan fried them. I pan fried them in shallow 1/2 inch of vegetable oil. You can use either canned pineapple chunks or fresh pineapple. 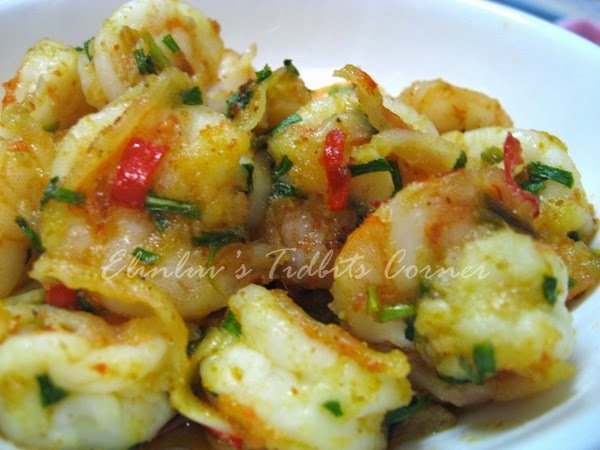 I used fresh ones for a tangy flavor...it was truly AWESOME bites :) Try it to believe me ! Set your oven to 375F. Cut the pound of bacon in half. 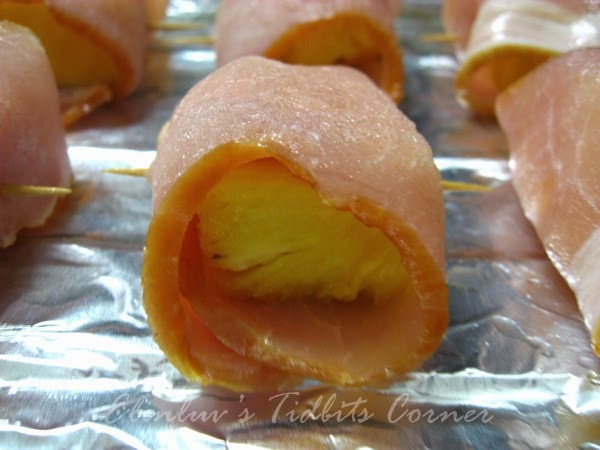 Take a half a slice of bacon, put a chunk of pineapple on one end of the bacon slice and roll up. Secure with a toothpick. 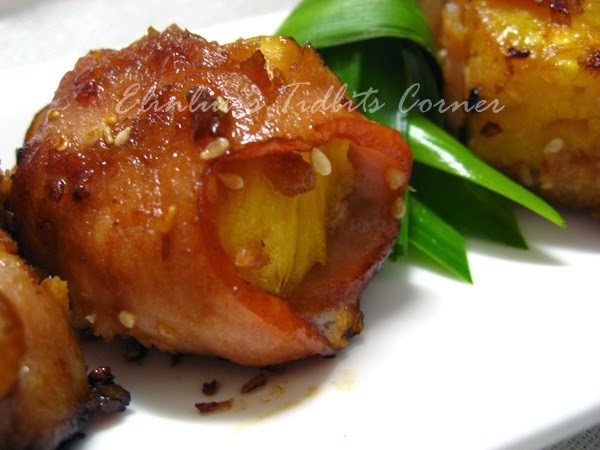 Lay the bacon pineapple bundles onto the rack. Brush the prepared glaze sauce over the roll up and bake for at least 25 minutes, brush again half way through baking. The bites are ready when the bacon looks brown and crispy. Heat up 1/2 inch oil in a shallow pan. When oil is hot, gently put in the roll up and pan fried them till crispy and brown. Take out and place in kitchen paper towel to drain off excess oil. 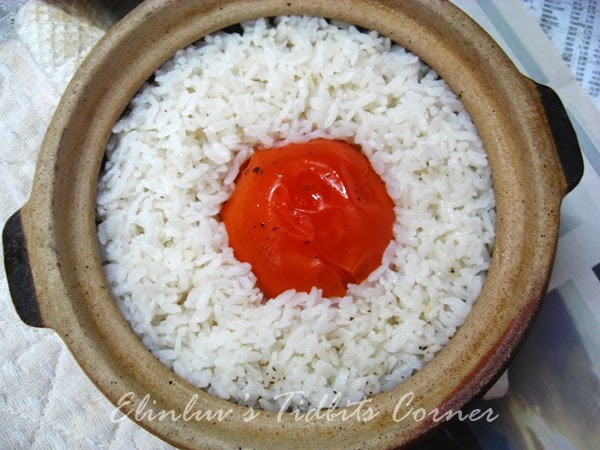 This simple tomato rice is easy to whip up and taste wonderful too...not to mention it is healthy rice for people who wants to eat healthy. I first saw this on fb when Grace Choo my friend shared on her fb. I told her I am going to try it out and truly it is easy to whip up and it is delicious..surprisingly WB loves it too for a man who eat meat only ! 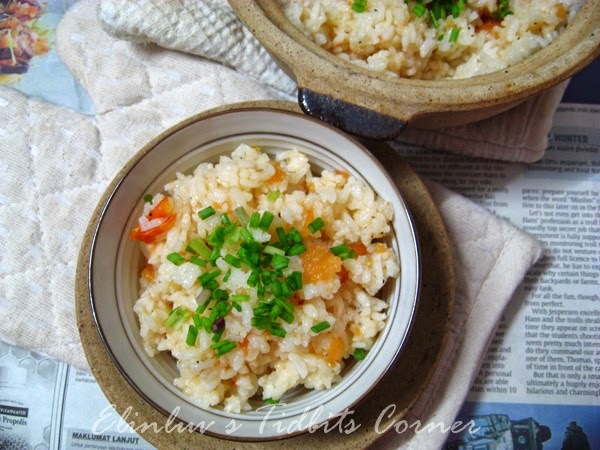 Sunday is a day we eat simple and making this tomato rice was a good choice. 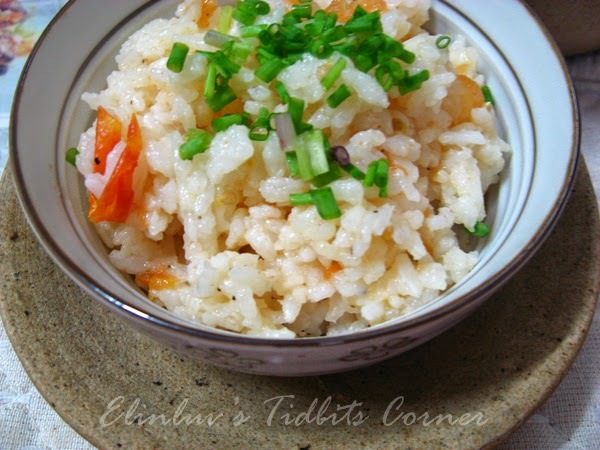 I used up the sushi rice grains which had been sitting in the fridge for months :p It turned out a bit wet after mashing the tomato but after it cools down, the grains becomes harder and drier. My first attempt, haha so was not sure how much water to add in and thus my tomato rice was a slightly wet. and you are ready to serve . 1. 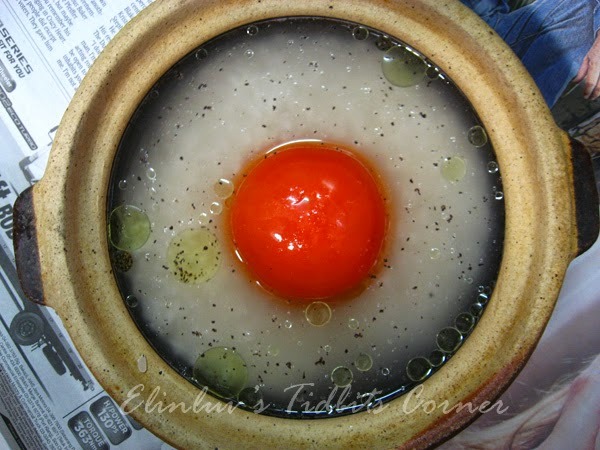 Boil rice vinegar and sugar, stir so that sugar will not set to bottom. Let it cool down completely before use. 2. Peel papaya. Half the fruit, remove seeds and rinse the fruit. 3. Cut into small pieces and slice with a mandolin. 4. 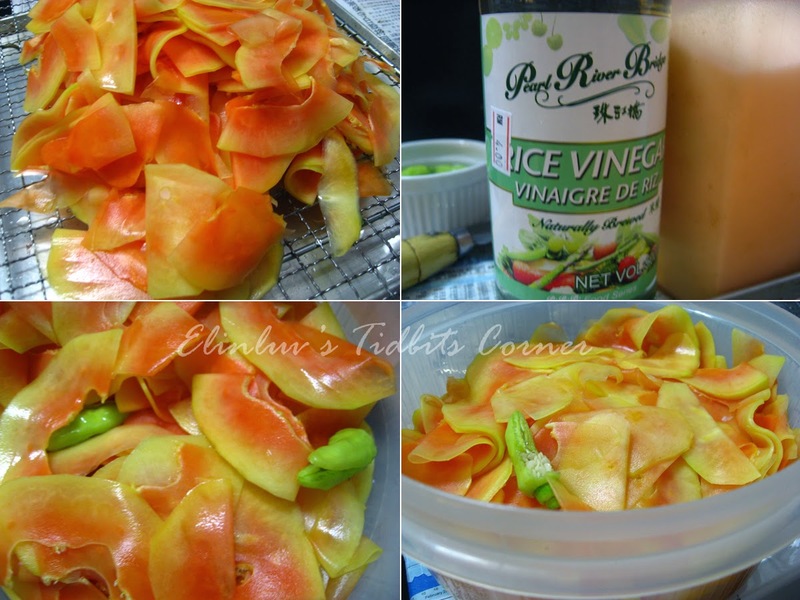 Put salt over sliced papaya and rub salt all over papaya slices. Make sure the slices do not stick together and are properly rubbed with salt. 5. Leave salted papaya for 5 mins ( not too long ) the papaya is ready to be rinsed when it looks pliable. 6. Rinse slated papaya twice. Shake off excess water. No need to squeeze. 8. Snip bird's eye chillies and pour cooled vinegar syrup over. 9. 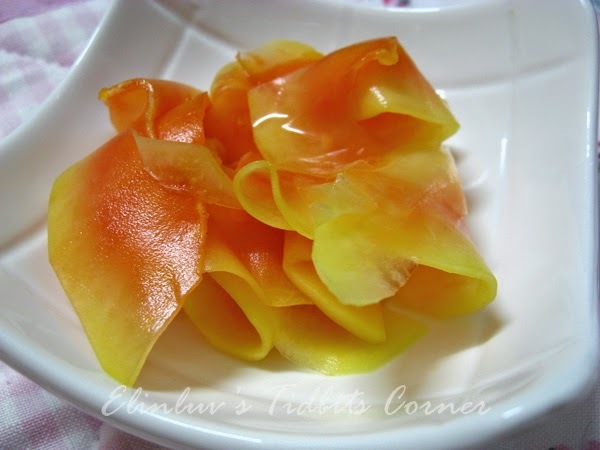 With a clean dry chopstick, stir papaya slices to make sure the papaya is submerged and coated with the vinegar syrup. 10. Let the papaya sit for a few hours. Adjust taste. 11. 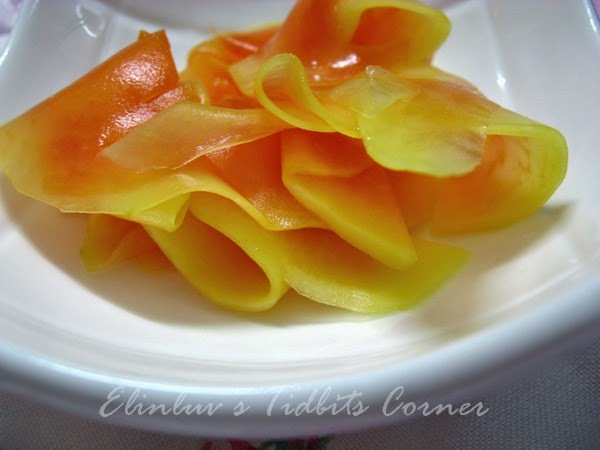 Let papaya pickle for at least 2 days in the fridge before serving. 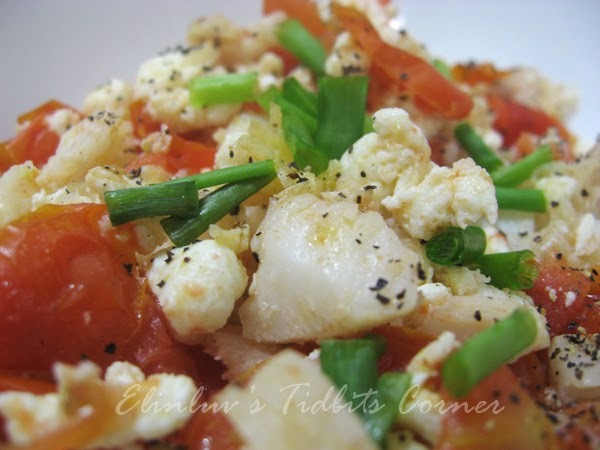 This dish is so freaking healthy...egg whites, fish fillets and tomatoes and home grown spring onions make up one delicious dish for dinner. 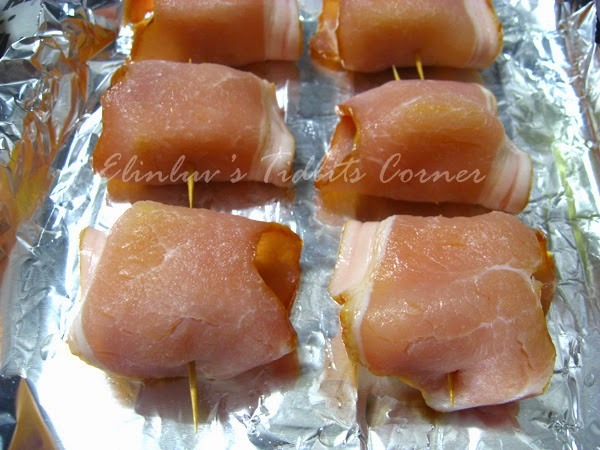 You can eat them wrapped in lettuce cup or as a stand alone dish. 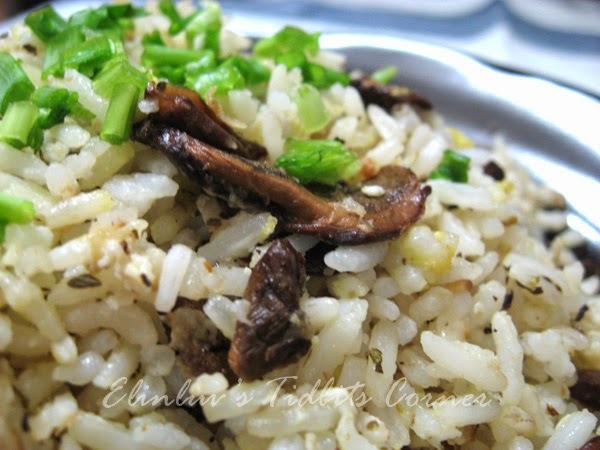 I browse through tastehongkong.com and found that many of her recipes to my taste and I have KIV many of her recipes to try out. 2015 will be a more healthier and more delicious year for me and WB. 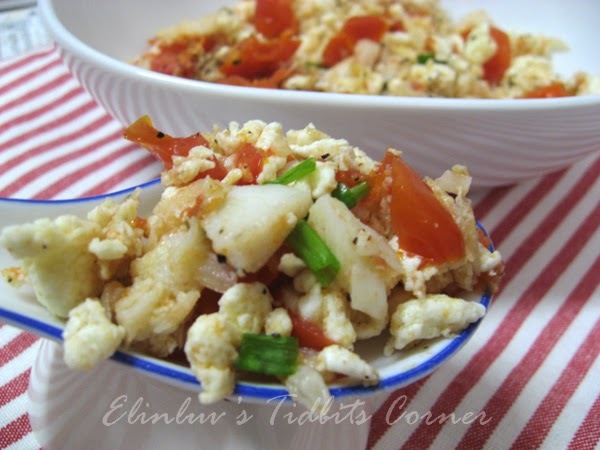 I am glad that I tried this out and I can conclude that healthy food can be delicious too. 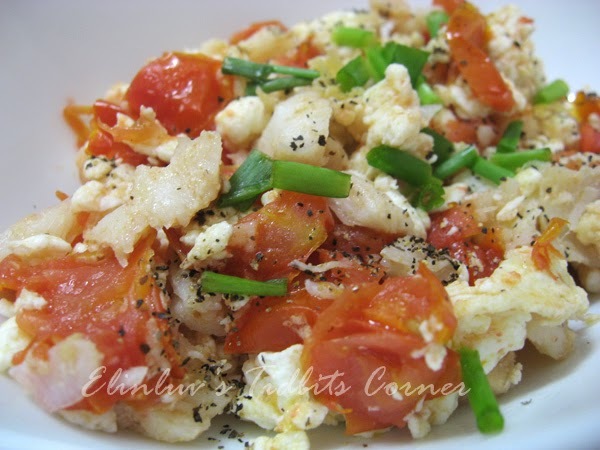 Making scrambled egg whites can be a challenge but I overcome it after following the instructions to the T :) I sprinkled some freshly ground black pepper on top to make the dish more outstanding :) I will definitely make this again. 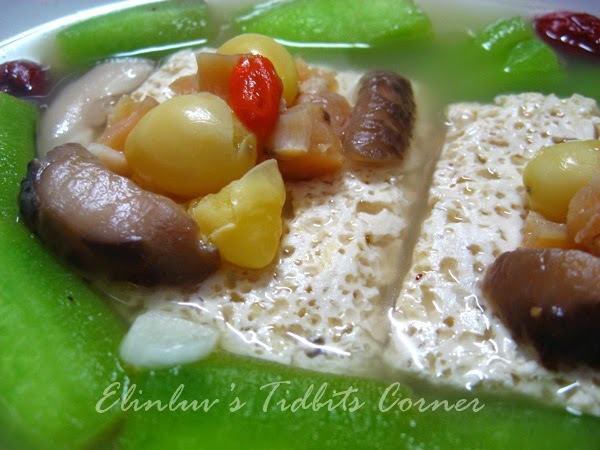 This is another wonderful dish using the spongebeancurd. 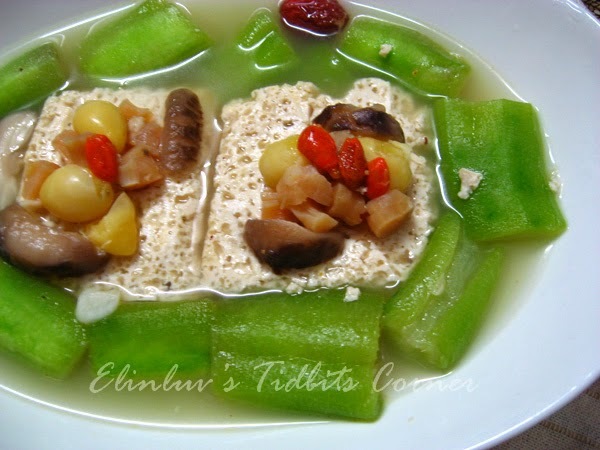 This time, I braised the sponge beancurd with luffa in chicken broth with gingko, red dates, dried scallop, dried shiitake mushrooms and goji. 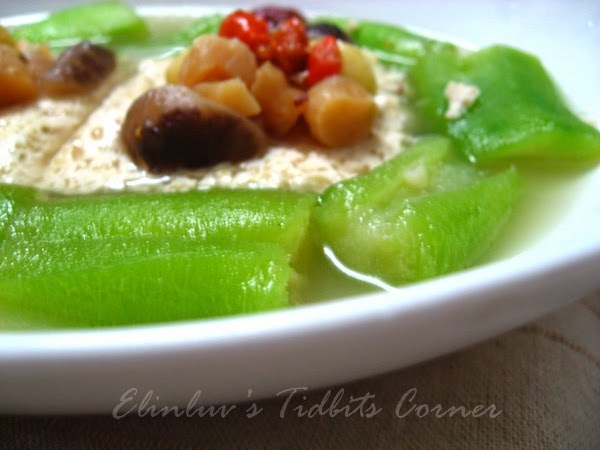 The delicious and tasty broth is absorbed into the soften luffa and sponge beancurd. I leave you to imagine how wonderful and tasty this dish is. Healthy too ! 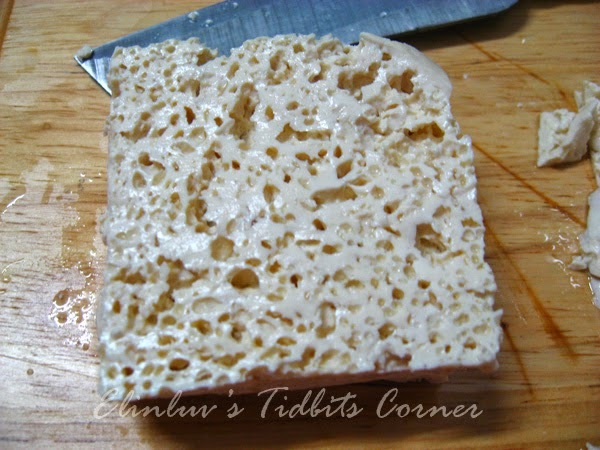 :) Simply love the sponge beancurd. 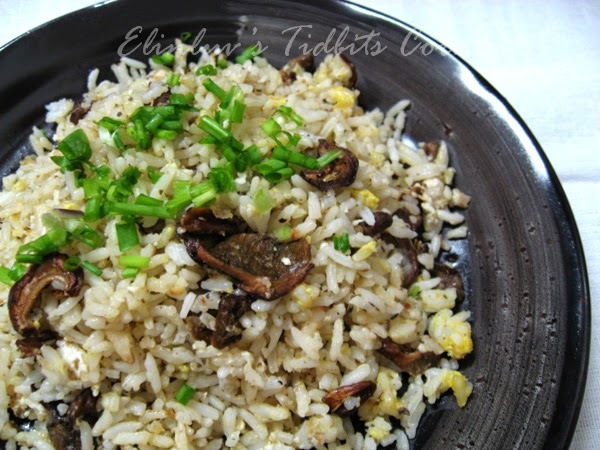 I have to make one load of it and they are so versatile that I can make a few dishes using them. 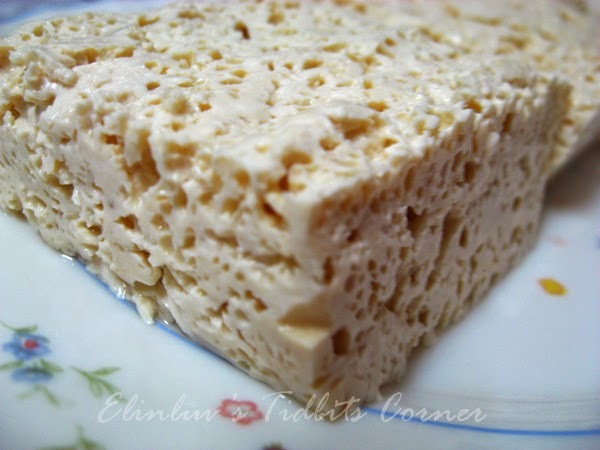 Try making them and I am sure you will not regret taking the time to make the sponge beancurd . 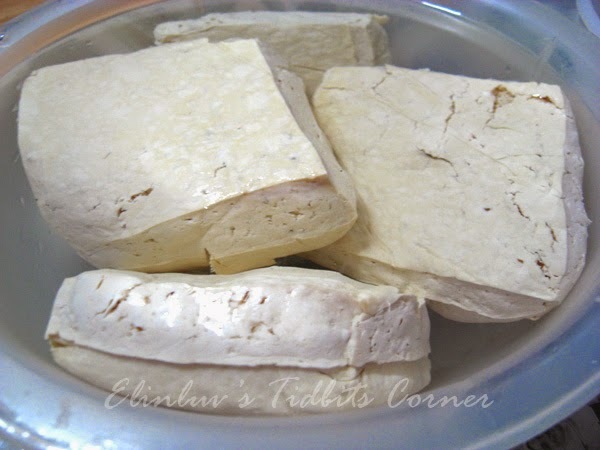 Regarding making sponge beancurd , some of my friends shared that these firm tofu/beancurd can also be freezed and you will get the same result as the boiled ones. I am not sure whether the texture will be the same but for the method I used, boiling firm tofu, the tofu remains soft and spongy. 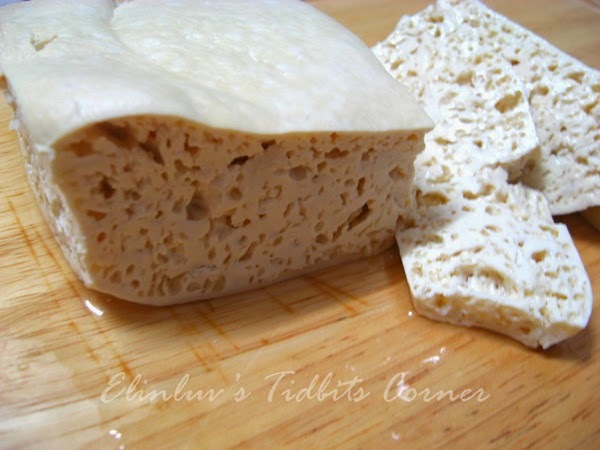 I will try the freezing method in my next round of making sponge beancurd and see the difference in texture. 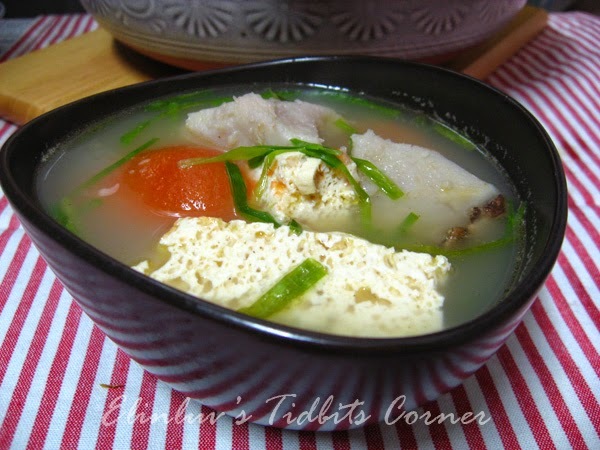 Boil the chicken broth in a medium sized soup pot together with , dried scallops, mushrooms, gingko, goji and red dates and sponge beancurd over medium low heat for 40 mins. Add sea salt to taste. Add in the luffa and once the luffa is soft, the dish is ready for serving. 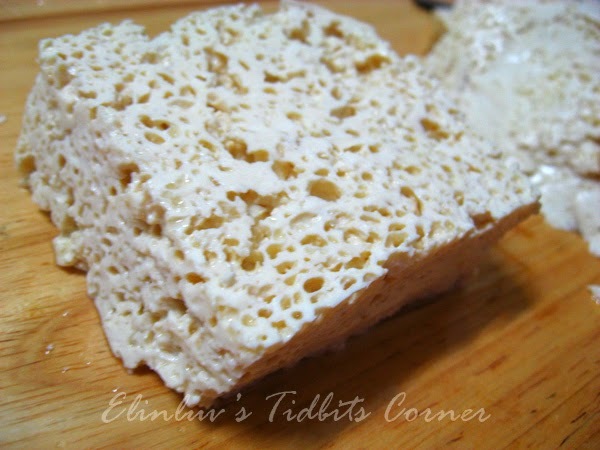 Gently scoop up the sponge beancurds into a servimg deep dish, arrange the soften luffa around the sponge tofu. Garnish top of the sponge tofu with gingko, goji and red dates and dried scallop. Gently scoop up the tasty broth over the luffa and benacurd. 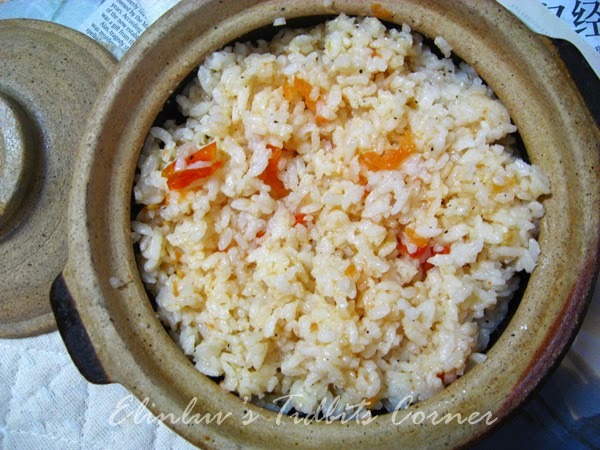 Serve with piping hot rice. 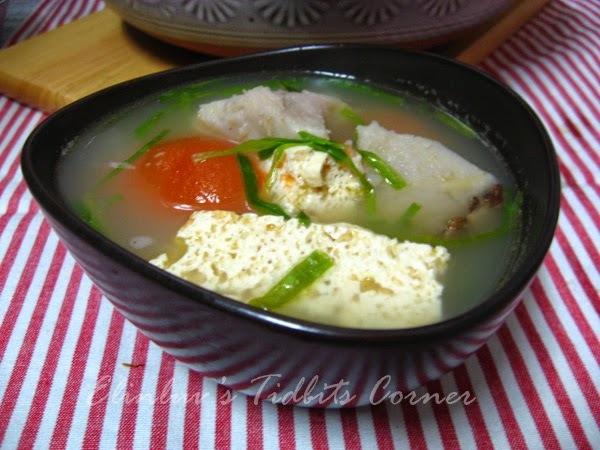 After having learned how to make spongy hole riddled texture beancurd, I used them in my fish head yam soup. 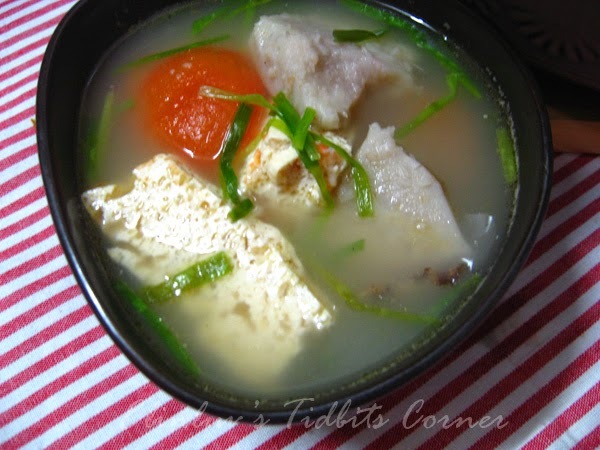 The reason being the tofu with spongy hole riddled texture will be able to absorb more of the tasting soup and thus making this bland tofu more flavored :) This is so delicious that surprisingly WB who is not fond of fish, slurp down two bowls of this flavorful fish head soup :) God was on my side..the yam so fluffy and creamy and the fish head was sweet and fresh and the homegrown organic spring onions round up the flavor and making this a winner soup of the year in my family menu . 1. 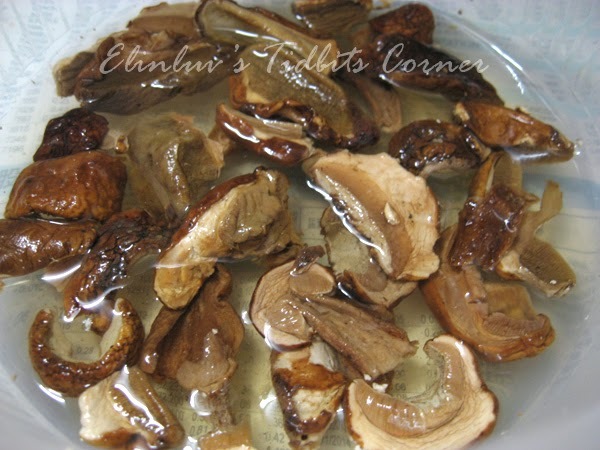 Heat up oil in a claypot, when oil is hot, put in ginger and stir fry till fragrant. 2. Add in yam slices and fry till yam is half cooked and the surface is slightly golden. Dish up the yam. 3. 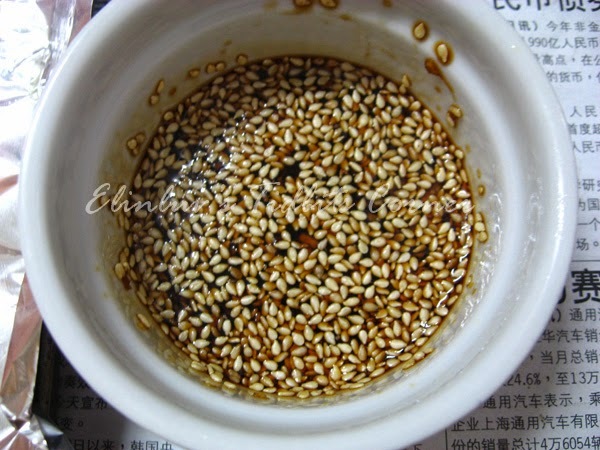 Add in the fish head and fry till it is light golden color. Add in the chicken broth and let is simmer under low medium heat for 20 mins. 4. 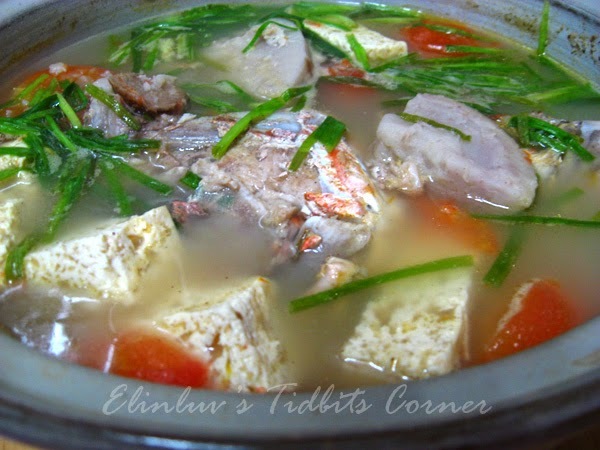 Add in tomatoes, yam, and spongy beancurd. Continue to simmer soup for another 3/4 hour under low heat. When the soup is aromatic...add in salt to taste, ground white pepper and continue simmer a further 5 minutes. Before dishing up, add in spring onions. Off heat and serve hot.